Engagements this season include appearances as soloist with the Deutsche Staatsphilharmonie Rheinland-Pfalz, Philharmonia Orchestra, London Mozart Players, Sinfonia Cymru and Young Musicians European Orchestra (in Israel). He returns to Wigmore Hall, makes his debut in Tokyo (Musashino Hall), performs George Benjamin’s Viola, Viola at the Southbank Centre on the invitation of Tabea Zimmermann, and gives recitals at Saffron Hall, the Newbury and Kilkenny Festivals. In 2017 Champs Hill released his first CD of music by Vieuxtemps to critical acclaim. 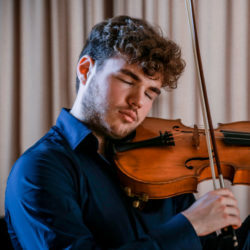 Sought after as a chamber musician during 2018 Timothy takes part in the Heimbach (Germany), Valdres Sommersymfoni (Norway), Boswil and Musikdorf Ernen Festivals (Switzerland); and undertakes projects at the Musikverein (Vienna), Louvre and Salle Cortot in Paris. He collaborates with Sir Andras Schiff, Steven Isserlis, Lawrence Power, Nobuko Imai, Frank Dupree, Frans Helmerson, Christian Tetzlaff, Isabelle Faust, Pavel Kolesnikov and Gabor Takács-Nagy. Future engagements include his debut at the Konzerthaus Berlin, a residency with Baden-Baden Philharmonie and a performance of the Walton Concerto with the Tonhalle Orchester Zurich. Born in London in 1995, Timothy studied at the Royal Academy of Music with Martin Outram, graduating with the Queen’s Award for Excellence. He was selected by Young Classical Artists Trust (YCAT) in 2016 and in the same year joined the Kronberg Academy in Germany, where he currently studies with Nobuko Imai. Awards include 1st Prize at the 2014 Cecil Aronowitz and 2nd Prize at the 2015 Windsor Festival International Competitions. Over the last two years Timothy has performed across Europe including the Verbier Academy & Festival and Schloss Elmau, the Munich Gasteig, the Bad Kissinger Sommer, Schubertiade (Austria) and Beethoven Bonn Festivals. He has attended IMS Prussia Cove Open Chamber Music and performed with the Nash Ensemble. Solo appearances include the Rotterdam Philharmonic Strings, European Union Chamber, Zagreb Soloists and Oxford Symphony Orchestras and a special performance of Mozart’s Sinfonia Concertante with Maxim Vengerov. He has participated in masterclasses with Christoph Eschenbach, Sir Simon Rattle and Gidon Kremer, among many others. Timothy is very grateful for support from the Amaryllis Fleming Foundation and Bowerman Charitable Trust. Timothy plays on a Viola by Peregerino di Zanetto c1565-75 generously on a temporary loan from Beares International Violin Society. Copyright © MCS Young Artists All Rights Reserved.